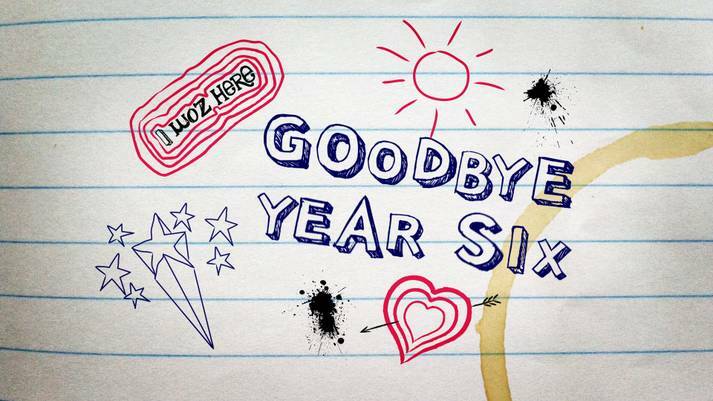 Exciting news, the programme that was being filmed in our school last term, ‘Goodbye Year Six’, is scheduled to start on Monday 3rd September at 4.30pm on the CBBC channel. All five programmes will be shown in that week at 4.30pm every day. I must confess to having had a little sneak preview and it’s really good! I’ve also heard that Stacey from Eastenders (actress Lacey Turner) is doing the voice over… and that she is a big fan of Patronic. All of the details can be found on the CBBC website. Charlotte who produced and directed the programme would love to know what you think of the programme, so leave your comments below and I will pass them on to her. Looking forward to seeing you all next Wednesday. I’m not happy about this! When I left year 6 in Heavers we didn’t do anything like this. Hello Sherhys, lovely to hear from you. I’m sorry you missed out on being filmed. I hope this doesn’t put you off watching the programme! Send my love to your mum, I hope you are both well. this used to be my old school but i left when i was in year 5 i am now in year 9. I can’t wait to see this i am so looking forward to it . Really nice to hear from you. I hope you enjoy the programme. This is going to be sooo cool – can’t wait to see myself on tv – it’s going to be wierd but cool at the same time……. I’m sooo nervous!!!! – I just want tomorrow to come! !- and Tuesday, as I will be starting secondary schoool!!!!! just watched the programme. i was hoping my daughter would be able to come to your school next year and after watching this programme it is definatly going to be top of our list. good job year 6’s. hope you all enjoy year 7! What a lovely message. I am so glad that you like our school. Please come in and visit us in person any time. I hope you enjoy the rest of the series. I really enjoyed watching the programme, it was really good!!!! I really enjoyed Patrick and Giovannes beat-boxing part, they were really good!!! – cant wait to see the rest. Madison and I really enjoyed watching it, good to get the children’s perspective on their time at Heavers. I remember going to Heavers Farm in 2004. Good times! But the kids in this programme seem to have a lot more fun than we used to have! It was well hard back in the day. lol! I’ve been wathching it and I was cracking up laughing all of them were so funny especially Patrick. I really miss Ms Papas! she was soooo lovely!! I wish I could go back to school at Heavers Farm!! My little brother is starting at Heavers Farm next year and I can’t wait to see Ms Papas again! Plus I am loving the programme!!! What a lovely message. We look forward to your little brother joining us soon. I really love this programme! been watching it with my son. he was bullied serverly and was actually thinking of going to heavers but all the places were filled when we tried to apply. we are going to try again next year though. good job ms papas. you are obviously a brilliant educator! looking forward to the rest of the show! Hi just watched the show, it was really good, best part for me was when Patrick was beat boxing. What a nice comment, although I couldn’t do it without brilliant staff and, of course, lovely children! We look forward to you and your son joining us in the not too distant future. I’m glad you enjoyed the show. I hope you’re feeling a little better. OMG! I look soo stupid! I feel so weird about being on t.v! Miss Papas I miss you! But year seven is great! Miss everyone at Heavers Farm!!! Well Mrs Papas I have really just enjoyed watching goodbye year 6, my mum and Taylor my brother have been watching too..it was nice to see all the teachers who taught me in year 6… I wish it could of been the year 6 I was in as it would have been so nice to be on telly, but never mind I had many happy years as the school.. I will pop in one day and see u again.. I miss everyone especially Serruner. Nice to hear from you. I am glad that you have happy memories. I hope you are doing well in school. No you don’t look stupid, you look absolutely great!Thank you for your contributions to ‘Goodbye Year Six’you brought a lot of humour to it. We miss you too, but we are glad that you like your new school. Come in and see us soon. Lovely to hear from you. How is life as a TV star? I’ve had so many lovely comments and messages about you, you should feel really proud. I hope that you are settling well into your new school and that you are making lots of new friends. Come in and see us soon. I just finished watching the series and it was amazing! I remember being in year six in my old primary school and it was so sad leaving! But I’m in my second year at secondary school now and loving it! Ps. That prom Looks great I wish my ps had it! Thanx Miss I have settled in well I really cried today when I watched it. Thank you for taking the time to leave us such a lovely message. Your advice is very thoughtful and useful. Hey Kelsey!! I miss you! Miss Papas can I come and visit the school next week? After school? Hope so!! LOL I found it really funny watching our prom! Me and my ‘date’! aww and Kelsey looked beautiful in her dress didn’t she! Her mum cried! Of course, look forward to seeing you. Hey Cookie do u go to Harris Academy? I watched this programme and it was sooo cool! I’m so sad that the series is over – I miss Heavers Farm soo soo soo much, this show really brought back memories. Secondary school is really fun, and I will be visiting Heavers Farm in a couple of weeks!! I can’t wait!! Omg mrs Papas you are a very great teacher I went to a school called Whitchurch Junior school and I was so scared leaving that school this year now i am in year 7 I hope you do more series next year. By the way Cookie I hope u enjoyed you date it was so sweet seeing you take a picture with your date. Mrs Papas my school is in the west of london where is your school because I really want my brother to join this school but if it is too far then he cannot I hope it is near us. Serrenur I feel so sorry that u didnt go to the same school as your best mate katie, I think her name was. By the way Cookie you dont look stupid u actually look really nice. Mrs. Papas how did u ge the opportunity to be on this show and who chose this school to do it. Thank you everyone for taking the time to read this especially Mrs.Papas, Cookie, Serunner and Katie. Oh, sorry I thought the earlier message was from you! Maybe it was Kelsey D. I hope you are doing well and enjoying your school. I am sorry to hear that you were scared when you left your last school. We are in South Norwood, which is in the South of London which may be a little too far for your brother to travel. We got the opportunity to do the show because the programme makers were originally looking for a school that held a school prom for the Year 6 pupils. They found our website after searching on the internet and asked if we would be part of a programme they were making. I hope that you enjoy your new school and thank you for taking the time to leave us such a lovely message. Thank you for your kind message and I am glad that the programme has helped you to prepare for Year 6 and to feel positive about your move onto secondary school. I hope that you enjoy your Year 6 experience and that you have as much fun as our pupils do. I actually want to thank you for your time to reply to my comment. It is a real shame to hear that you are a little to far for my brother to come into your school once again thank you. I’d be so grateful if you reply! Madeline, I’m sad too! I’d love to see more of the children at heavers farm. Nice to hear from you. Where are you living now? I hope you are well and enjoying school. Let us know how you’re getting on. It is very nice of you to say. However, it’s lovely parents like you and lovely children like Caleb that make our school what it is. Thank you for taking the time to reply! I live in North London, well, it’s not even really London anymore! Just on the very outskirts. My little twin sisiers were going to start there, but then we moved, so now they go elsewhere. I’m sure they would have loved to come to heavers farm! I was so sad when I had to leave. I was crying loads! I LOVED the show. Absolutely loved it. The only problem was 5 episodes were not enough! Their journey is far from over and I would love to know how the stars of the show are doing in their new schools and their reaction to the show a year after it being shown. The show showed the kids pure emotion, their rawness and I honesty couldn’t stop watching it. Thank you Heavers Farm for allowing us to witness the diversity and pure heart of your School. I am glad that you enjoyed the show. The children are stars indeed! Nice to hear from you. I hope you are doing well at your new school. See you soon. I know I don’t live in London but boyyy would I like to come to see my friends and the school. Amar here by the way! Lovely to hear from you by the way! I hope that you are doing well in your new school. Maybe one day you could return to London and come and say hello to us all. Best wishes to all of your family. Thank you Tia for leaving such a long and thoughtful message. I am sorry to hear that you find secondary school so stressful. I hope that in time you find it more enjoyable. A happy New Year to you too! I hope you have a good 2013. Do any of u know a girl called Katie Kirby who is in year 7 as I saw her in an episode of goodbye year 6 if u do plz contact me.my address is laurendyer200@hotmail.com. I want another series of goodbye year 6 because I loved it soooooooo… much! I wish there could be a show about how the year 6’s are getting on in secondary school?